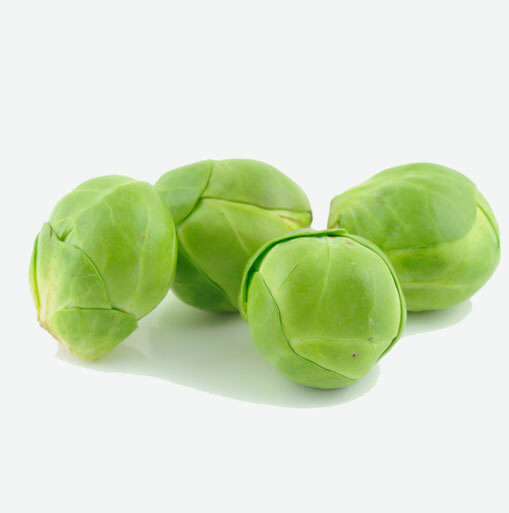 The origin of brussel sprouts is unknown. They have been traced to the late 16th century and are thought to be native to Belgium, specifically to a region near its capital, Brussels, after which they are named. Brussel sprouts remained a local crop in this area until their use spread across Europe during World War I. Brussel sprouts are now cultivated throughout Europe, U.S.A. and Canada. Brussel sprouts look like miniature cabbages and are related to cabbages and broccoli which makes them members of the brassica family. They grow in bunches of 20 to 40 on the stem of a plant that grows as high as three feet tall. Brussel sprouts are typically sage green in color, although some varieties feature a red hue. They are oftentimes sold separately but can sometimes be found in stores still attached to the stem. Perfectly cooked Brussel sprouts have a crisp, dense texture and a slightly sweet bright and “green “ taste. Brussel sprouts are an excellent source of Vitamin C which is the body’s number one water-soluble antioxidant. This vitamin is necessary for the manufacturing of collagen by the body to aid in healthy skin, connective tissue, cartilage and tendons. Did you know that just one cup of brussel sprouts contains whopping doses of Vitamin A which is needed for healthy glowing skin. Choose brussel sprouts that firm, compact and vivid green. Discard sprouts that are yellowed, have wilted leaves or are puffy and soft in texture. Avoid those that have perforations in their leaves as this may indicate that they have aphids residing inside of them. If brussels sprouts are sold individually, choose those of equal size to ensure brussel sprouts are best kept unwashed and untrimmed in the vegetable crisper of your refrigerator in a plastic bag. They keep up to five days. Wash the sprouts well just before using. Before washing brussel sprouts, remove stems and any yellow or discoloured leaves. Wash them well in a bowl of water with a teaspoon of salt. Drain them and rinse well under running water. This helps to remove any insects that are in between the leaves. Cook brussel sprouts whole. To ensure an even texture when cooked, cut an “x” in the bottom of each stem just before cooking them. Brussel sprouts are usually served as a side dish but they also make a nice addition to cold salads when they are steamed. Try mixing cooked brussel sprouts with sliced red onions, fresh Italian flat leaf parley, chopped and sprinkled with almonds or pecans. Add some extra virgin olive oil with apple cider vinegar and you have a great salad.